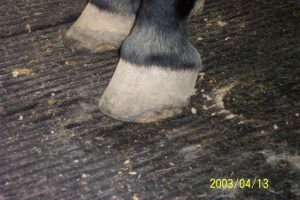 « What is Hoof Care Continuous Improvement? The first time I saw a Paso Fino it was rapidly carrying a rather large man who was holding a saucer with a full tea cup…smoothly. I was impressed and had to find out more. What I found was that the Paso Fino was, at the same time, the first horse breed to come to the Americas and one of the last to the United States. Columbus brought Spanish Jennets and Andalusian horses to the Caribbean on his second voyage in 1493 to the Dominican Republic. Spanish landowners in the Caribbean bred the Paso Finos and their stallions and breeding mares served as the foundation stock for remount stations of the Conquistadors and spread throughout Latin America. But the Paso Fino wasn’t brought to the mainland United States until around 1945 by servicemen who “discovered” the breed in Puerto Rico. 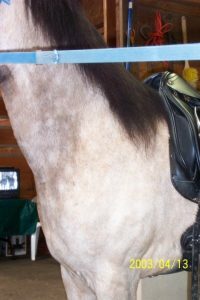 Paso Fino means “fine step” and was bred from the Barb, Spanish Jennet, and Andalusian horse. “Los Caballos de Paso Fino” – the horses with the fine walk – were developed by Spanish landowners to give them a smooth comfortable ride as they toured their estates. These tough horses often carried 300-pound landowner “Dons” over many miles. Pasos are renowned for their energy or “brio”. Indeed, the Columbian stallion, Resorte, was reported to need 18 kilometers of ponying before he could be ridden. Today, Pasos typically come in three or four sizes. The Puerto Rican Paso is generally the smallest and lightest boned, often under 14 hands. The Columbian Paso, the most common in the U.S., is larger and heavier, around 14 to 15 hands. The Peruvian Paso is still larger and heavier. The Mangalarga Marchador, while not officially a Paso, is a horse from Brazil that has a similar gait as the Paso Finos and has been referred to as a 17 hand Paso. I won’t go into too many details here about the breeds. The basic knowledge we need as farriers is about the Paso Fino gait. Essentially there are three Paso Fino gaits. The Paso Fino gait is a four-beat evenly spaced lateral gait, LH – LF – RH – RF. They are ridden in the show ring across a sounding board to demonstrate the distinctive 1-2-3-4, 1-2-3-4 beat sound. There is very little up and down movement in either the croup or the shoulder of the horse. It is known as a “swimming” gait; winging out at the front and in at the rear. The “Fino” is a short rapid step that covers very little ground. The “Corto” is a more extended gait that covers ground like a trot. The “Largo” is the most extended gait and can cover ground like a canter. What is important to know here is that these gaits are hereditary and are tied to the individual horse’s conformation. For this article I differentiate between “Fino” and “Largo” Pasos although this distinction is not commonly used. It is only my theory. The more upright shoulder and shorter hoof walls of the Fino horse allow and encourage the shorter higher step. This horse will naturally take short, fast steps and be a smooth ride at slow speed. The Fino horse will be able to do a largo gait but not as fast and, if pushed to greater speed, will have a tendency to break into a canter. The more shallow shoulder and longer hoof walls of the Largo horse encourage it to move at longer strides. Don’t expect a Largo horse to move like a Fino horse at slow speeds and the ride will often not smooth out until greater speed is reached. Paso Finos should be trimmed at their natural angle depending on their conformation. Some Paso Fino owners will expect that their horses will gait comfortably at any speed. This is not the case and trimming to try to get that will frustrate you and the horse. Pasos are shown barefoot or flat shod so trimming is everything. Judges want to see the natural gait of that particular horse. I usually trim the hoof wall level with the sole and don’t carve the sole to take more toe. This will balance the sole to the ground and balance the hoof according to the conformation. Due to their “swimming” gait the hooves may naturally be toed out, so it should not be corrected or the gait will be restricted. Pasos typically don’t roll over at the center of the toe. The Fino horse toes will appear shorter and will naturally tend to grow more heels. Often the frog will not be on the ground. The Largo horse will appear to have longer toes and will grow more toe than heel. Paso Finos generally have nicely shaped hooves with thick hard hoof walls and nice thick concave sole. 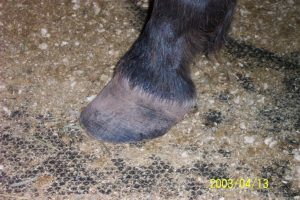 The hoof sizes are typically in accordance with the different types; the Puerto Rican Pasos have the smaller hooves and the Peruvian Pasos have the largest with the more common Columbian Pasos in the middle sizes. A lot of care over 500-years was put into breeding Paso Finos to be naturally gaited; tough and easy keepers. Their hooves are the same. 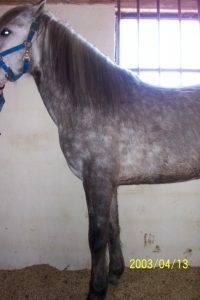 A natural trim according to their conformation is all that is needed to allow the horses to perform as they were bred. When I gauge my paso finos hoofs what should the gauge read on the front and on the back? I just recently got a Peruvian Paso. She walks like her feet are sore. Could she be trimmed wrong? My vet got on my case about my horses’ hooves because I mustang rolled the edge and because his inside (medial) wall is shorter than his outside wall. He does wing out naturally and toes out while standing; not like a peruvian but he is mostly Columbian Paso. My vet doesn’t believe in the Barefoot Trim and I’m clearly not going to get anywhere with her on it. My thought is that he is growing the outside wall longer due to his confirmational winging out and apart from balancing the walls to the sole level it shouldn’t be messed with too much. What is your thought ?